Automotive technology has made olympic quality leaps and bounds over the past ten years. Modern cars and trucks can do more than ever before. Some newer models can steer themselves into a tight-fitting parking spot and even keep themselves within the lane lines on the road. While self-made auto mechanics have been forced to think harder, our vehicles are requiring drivers to think less. Completely autonomous vehicles are the promise of the future, but today’s automobiles are already “gee-whiz” quality. Take a moment to read over this short synopsis highlighting a few of the most tech-savvy vehicles available on the market in 2017.
Who better to look to for innovation than the Tesla builders. 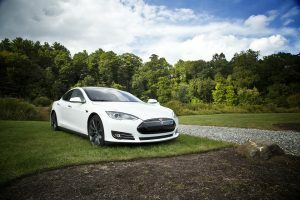 Tesla will bet its reputation in the automotive industry that their electric cars will drive the momentum of their future in sales. The CEO of the company, Elon Musk, has promised the public that Tesla will have autopilot hardware built into their production line soon. The company is also working to produce a mainstream pricing option for those who do not have $100,000 to drop on a new vehicle. Honda is at the forefront of the race towards technologically independent vehicles. The 2017 Honda Clarity is a midsize sedan with one of the best fuel cells available on the market today. The Clarity fuel cell works from gaseous hydrogen (as opposed to liquid hydrogen) to create power, and the cell will fuel the vehicle for an average of 300 miles before charging. The vehicle also offers a handy lithium-ion battery boost to turbocharge the engine for strong acceleration. The Honda Clarity sets its eyes on the future as hydrogen powered vehicles will be a long-term part of their future planning. The Genesis line is now considered a separate brand from Hyundai, just as Lexus is a separate entity from Toyota, and the Infiniti name is now separate from Nissan. It happens. For now, the Genesis brand can only be found through a Hyundai dealer, but that is expected to change by the year 2020. Researching the specs of this sporty and ecologically sound vehicle will reveal a party of pleasure and innovation. The 2018 Chevy Equinox Crossover is named as such because it is not a car or an SUV. It is somewhere in the middle of the two designs. The full redesign of the newest Equinox cut its weight by around 10 percent (that is an average of 400 pounds). Cutting weight boosts fuel economy and places less overall strain on the vehicle’s engine. A quick look into the tech specs of the Chevy Equinox Crossover will clearly reveal why it is on the list of most tech-savvy vehicles.